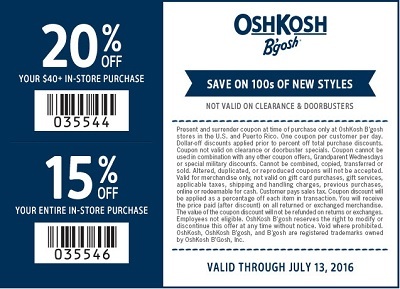 Here are some details about savings with printable coupon at OshKosh B'gosh stores in the U.S. Take 20% off your in-store purchase of $40 or more. Or, take 15% off your entire purchase! The only thing you have to do is to print a coupon and bring it to your nearest OshKosh B'gosh store location in the U.S. Source of the information is OshKosh B'gosh. Offer is valid until July 13, 2016. For more details visit OshKosh B'gosh store.